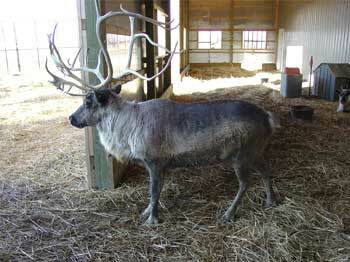 Santa's reindeer housed in Williams County. "Up on the housetop, reindeer pause, down comes good 'ol Santa Claus..." "When, what to my wondering eyes should appear, but a miniature sleigh and eight tiny reindeer..."
Carols and books have immortalized the role of the reindeer in Christmas stories for decades. Children everywhere will be searching the skies tonight for Santa's sleigh pulled by those eight tiny reindeer, bearing gifts galore for all of the good boys and girls across the land. But did you know that Santa keeps some of his reindeer right here in Williams County when they aren't with him at the North Pole? Indeed, he does. "We are blessed, very, very blessed to have the reindeer. It is so wonderful to be around them. They are absolutely beautiful and so gentle," said Debbie Disbrow, who takes care of the reindeer at her house near the Orchard Hills golf course. It all started last year, just three days before Christmas. Debbie and her husband Mike were building a barn for their horses. It was closed in, but still in the construction process when a little pot bellied pig got into the barn somehow. No one knows how, but there had been some tales of a pig running around the golf course. "All these years I've prayed for a reindeer, and God sent me a pig," Debbie exclaimed. Little did Debbie know that the very next day Mike went to his office and tried to find her a reindeer. He called the Reindeer Owners and Breeders Association in New York and discovered that there were two reindeer that were being kept at the Cincinnati Zoo so the children there could see them. the zoo didn't want to give them up, but Mike persuaded them to bring the two reindeer here to Williams County very shortly thereafter. "The man who brought them was little, with a white beard and white hair, and they called him 'Santa,'" Debbie said. "He told us to keep the reindeer here and take care of them, and he'd be back before Christmas to get them." "They love winter," Debbie said. "We lead them around a lot now, practicing, and getting them ready for Christmas. This is the time they play their reindeer games. You'll see them jump and hop. They leap. They put their heads down and shake their heads. They're practicing their flying when they're playing their reindeer games." The Disbrows have Donner and Gingerbread at their house. Gingerbread is one of Santa's extra reindeer in case someone is sick. Gingerbread had a baby, Cocoa, so now the Disbrows have three. 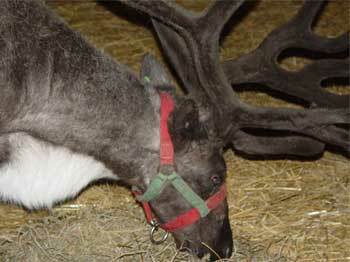 When they're born, Debbie explained, the tiny reindeer weigh only eight to 10 pounds, about the size of a cat. 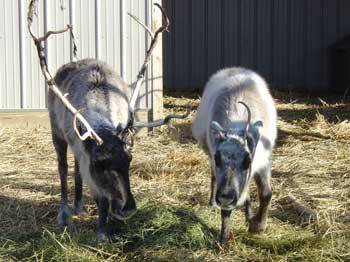 Their first antlers are called rudolphs, small fuzzy stubs, but the next year, they get their antlers. 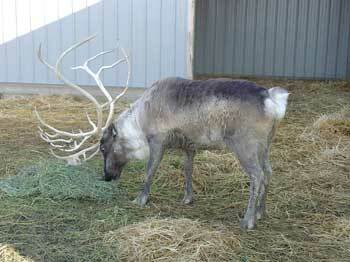 In the deer family, caribou and reindeer are the only species where both males and females grow antlers. The antlers start to grow in the springtime, and they're covered in rich, brown velvet. They lose their antlers in February or March, except for the pregnant reindeer who keep their antlers longer in order to protect their baby. "Their coats are very big and fluffy now to keep them warm in the winter. The outer hair is actually hollow (like a straw). It keeps them warmer and also buoyant, so they can swim easily in a river if they need to," Debbie reported. "God gave the reindeer forked hooves. It helps them walk in the snow. They are very, very good at walking in the snow. They don't make much noise. It kind of sounds like covers ruffling," Debbie said. "Did you know that the reindeer's legs click?" Debbie asked "Up on the housetop, click, click, click, down through the chimney with good St. Nick..." "Their legs click. It's their joints, not their hooves on the housetop that click. God gave them joints that click so they can hear each other when they're in a snowstorm and it's snowing so hard they can't see each other. Isn't that amazing?" "The babies don't click until they get old enough to be able to get themselves away from a predator. Cocoa was born in April, and she doesn't click yet," Debbie explained. 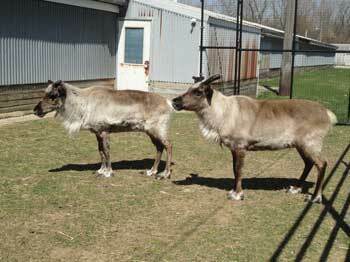 You may be wondering if Donner, Gingerbread and Cocoa miss the other reindeer while they're here in Williams County. They are fine because they have lots of friends at the Disbrow's house: Eight horses, two little goats, two miniature Jerusalem donkeys, a number of chickens and ducks, and a dog. Oh, and of course, the pot-bellied pig. The miniature Jerusalem donkeys have a cross on their back because they are the donkeys that Mary rode into Bethlehem to have the baby Jesus on Christmas Eve. Another Disbrow tie to the Christmas story. "They all cannot wait for Santa to come," Debbie relates. They get very excited when we come into the barn now. We have sparkle dust, which helps the reindeer fly." Debbie and Mike's grandchildren, Ida and Gretchen, are really lucky because they get to be there when the reindeer get their sparkle dust tonight, just before Santa arrives. So, start watching the sky when it gets dark. And be listening for that click, click, click of the reindeer legs. Tonight's the big night that children everywhere have been waiting for. "He sprang from his sleigh, to his team he gave a whistle, and away they all flew like the down of a thistle. But I heard him explain, 'ere he drove out of sight, 'Happy Christmas to all, and to all a good night.'"